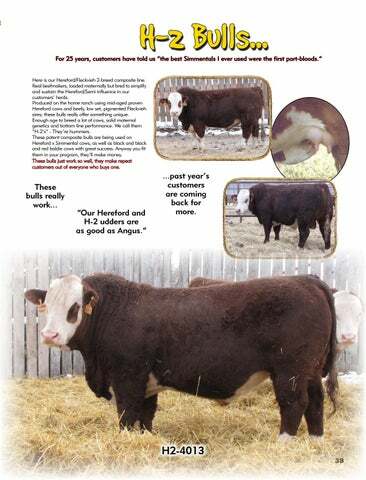 For 25 years, customers have told us “the best Simmentals I ever used were the first part-bloods.” Here is our Hereford/Fleckvieh 2-breed composite line. Real beefmakers, loaded maternally but bred to simplify and sustain the Hereford/Semi influence in our customers’ herds. Produced on the home ranch using mid-aged proven Hereford cows and beefy, low set, pigmented Fleckvieh sires; these bulls really offer something unique. Enough age to breed a lot of cows, solid maternal genetics and bottom line performance. We call them “H-2’s” - They’re hummers. These potent composite bulls are being used on Hereford x Simmental cows, as well as black and black and red baldie cows with great success. Anyway you fit them in your program, they’ll make money. These bulls just work so well, they make repeat customers out of everyone who buys one. 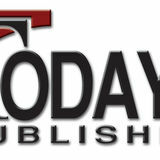 ...past year’s customers are coming back for more.